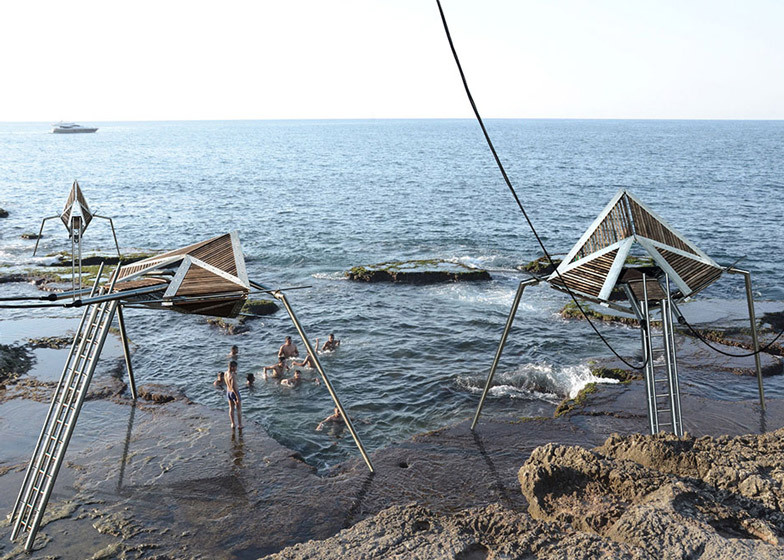 These conceptual three-legged structures have been developed by Najjar & Najjar Architects to allow Beirut's fishing community to reclaim sections of the coastline whilst generating electricity for local residents (+ slideshow). 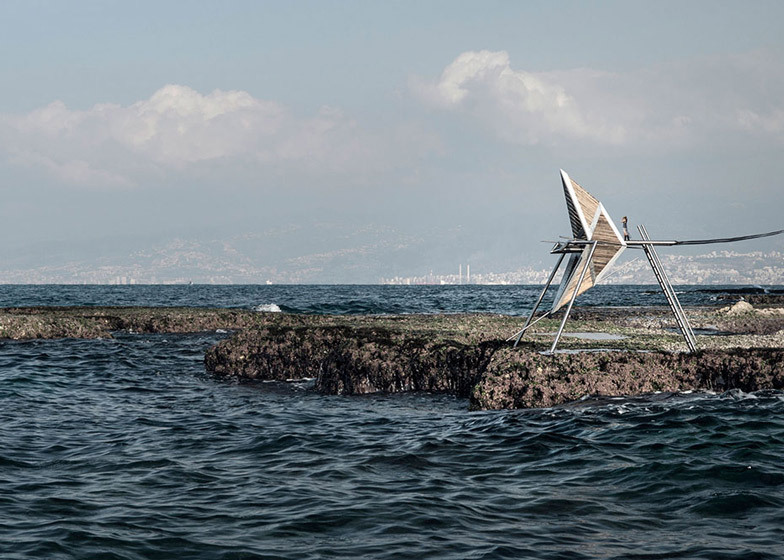 Najjar & Najjar Architects, who have an office in the Lebanese capital, propose installing the kinetic Iris structures along Beirut's shoreline to provide elevated shelters that also harness the movement of the waves to generate power. 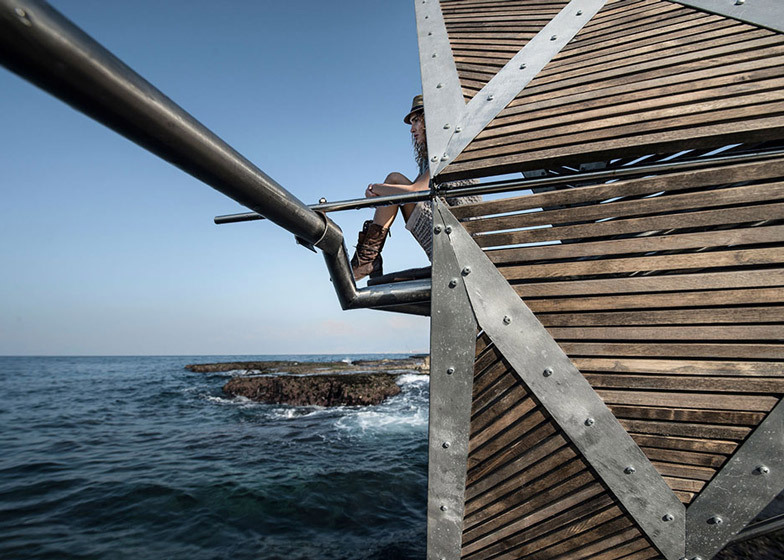 Studio founders Karim and Rames Najjar believe the structures would help locals retain public access to the seafront, which has been dominated by private development in recent years. 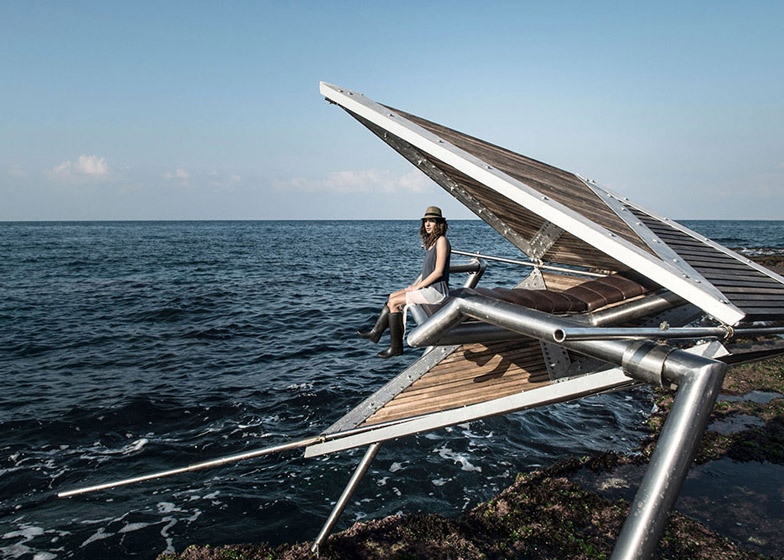 "The principal aim of Iris is to reclaim accessibility to the sea," said the architects. "For centuries, the local population of Ain Mreisseh and Manara lived in tune with their costal environment, but over the past decade the shoreline has become a playground for high-end residential developments that aim to turn a maximum profit by selling off unobstructed views to the sea." Each elevated structure would function as a public refuge where any visitor can experience an uninterrupted view of the ocean. "The dweller can experience the place, the passage of time and its natural forces," said the architects. The name Iris relates to the shape of the kinetic structures, which were designed to resemble eyelids. Each one would be connected by an antenna to a buoy floating in the ocean, propelling an electric generator that relays power to nearby homes. To demonstrate the concept, the team built a 1:5 scale model and tested it on the coastline. This was used to create the realistic images illustrating the project. Photography is by Ieva Saudargaitė. Here's more text from Najjar & Najjar Architects. Iris is an attempt at resisting the expropriation of Beirut's open coastline returning the sea back to the fishermen and the local habitants of the Ras Beirut district. Through architecture, it materialises the threshold condition between two very distinct, yet concomitant entities: the dense city and the open sea. 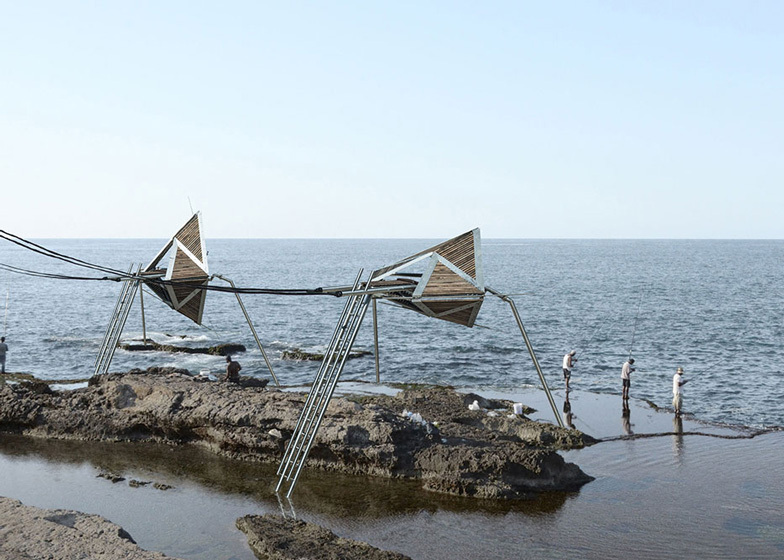 Waves transform the kinematic structure into an experience of place and to harvest energy for the fishermen community. Not so long ago, the Mediterranean Sea was not only a picturesque backdrop for fishermen's homes, gardens and plantations, but it also served as a generous and natural source of food and livelihood. For centuries, the local population of Ain Mreisseh and Manara lived in tune with their costal environment, but over the past decade, the shoreline has become a playground for high-end residential developments that aim to turn a maximum profit by selling off unobstructed views to the sea. The majority of the newly erected buildings are tall and massive volumes that completely disregard their surroundings by turning their backs to the city and the long-standing homes of the local people. The principal aim of Iris is to reclaim accessibility to the sea. 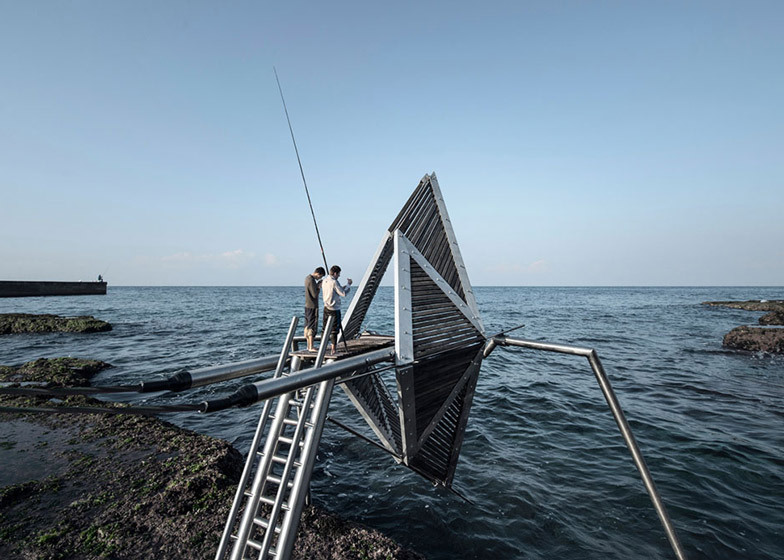 The spatial installations are brought to the forefront of the coast, and placed at the edge between a solid, physical ground and a fluid, emotive reality. They act as surrogate windows for the old houses that have been left to decay. The windows created by Iris are accessible civic refuges where the dweller can experience the place, the passage of time and its natural forces. The space is framed by a pair of metal and wooden eyelids connected, via an extended antenna, to a buoy floating in the ocean. The natural forces are scripted by means of spatial alterations: the eyelids open and fold with the cyclical motion of the waves that drag the buoy up and down causing Iris to blink with the rhythm of the sea. Iris is also utilised to harvest energy. The kinematic structure propels an electric generator that transmits, through a network of cables, the accumulated ocean energy to the dispossessed homes, returning to them what was theirs and illuminating once again the corners and alleys that now lay in permanent shade of new high rise structures. 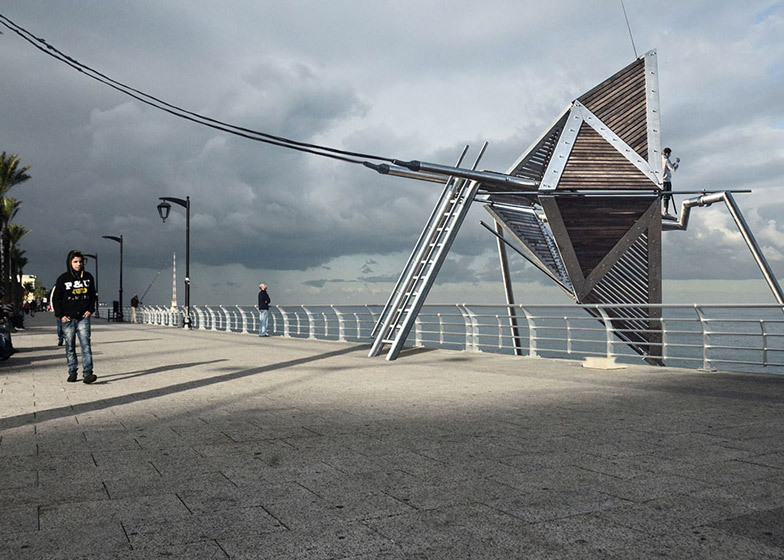 In multitude, Iris would populate the corniche and instil a much needed pulse of nature in the urban environment as well as offer spaces of intersection and conciliation: shelters from a lost past and an uncertain future of the city and windows towards the open sea and contemplative horizon.